This badge was issued to Hirokazu Tokuno on 24 Dec 2018. This badge earner understands how DeepLearning Neural Networks work. The individual understands different state-of-the-art DeepLearning frameworks. The earner can also apply their knowledge on different industry relevant tasks. Finally, they know how to scale the neural networks on data parallel frameworks like Apache Spark and GPUs. 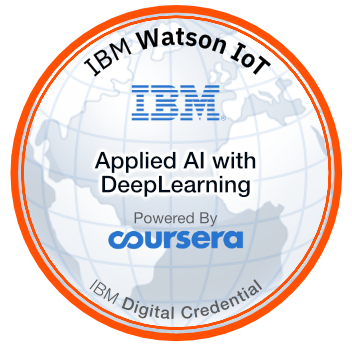 Complete the Coursera course "Applied AI with DeepLearning" including all hands-on labs and assignments.